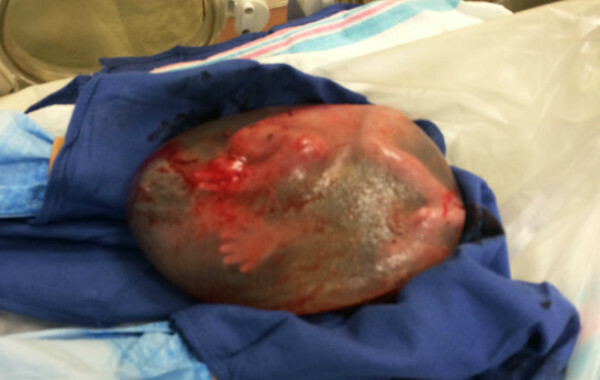 Here’s a birth photo unlike any you’ve seen before. 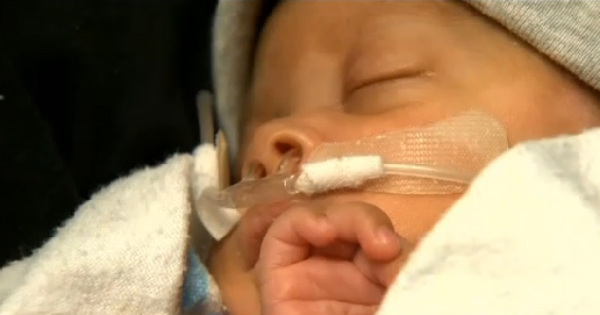 Baby Silas Johnson was born three months premature – and still inside the amniotic sac. Doctors at the Cedars-Sinai Medical Center in LA were amazed when the tiny boy was born inside an unbroken sac via C-section at 26 weeks gestation on December 6. Such a birth is incredibly rare – usually the sac breaks during labour, or doctors break it when they perform a Caesarean. Neonatologist William Binder took a photo just seconds after Silas’ birth, as the baby continued to get oxygen via the placenta. The baby is now 10 weeks old and doing well. And he’ll never be forgotten by the doctors in the operating theatre. The boy’s proud mum, Chelsea Phillips, didn’t even know about the fuss her son’s birth had caused until she saw the photo hours later. So-called “en caul” births are rare – it’s estimated they occur in only one in 80,000 deliveries. According to the Daily Mail, Jessica Alba’s daughter, Haven, was born inside the amniotic sac in 2011. Silas is due home next month, around what would have been his due date. Unsurprisingly, his mum thinks he is absolutely extraordinary.